G’day, mate! We’re down under today in the beautiful city of Sydney, Australia, specifically in an area where family homes have been built to enjoy direct access to freshwater lakes. But the view is only one of the reasons that this precise location has been singled out for homify 360°—it’s what looks out onto the lake that made our jaws drop. A villa that stands out most superbly from the traditional style of the neighbouring houses, flaunting a delicious modern look and playing with dramatic contrast between the front- and rear facades. It showcases the balance between suburban life and tranquil nature and, in doing so, presents a fabulous lifestyle for its style-conscious owners. We kick off with the rear side of the house, as this is the area that is more open. Large windows and doors let down their guards and allow plenty of space and natural lighting for the interiors. One of the most crucial points in the planning process was that the house allows the exterior- and interior areas to merge with each other—a feature that was clearly successful. Constructed on a raised platform, timber steps in honey colour lead to a most spacious terrace and fresh green lawn, which is where we can have a relaxing sit-down to enjoy the adjoining lake. Viewing the house from the front side facing the street, we can see that it’s more closed-off compared to the rear facade. 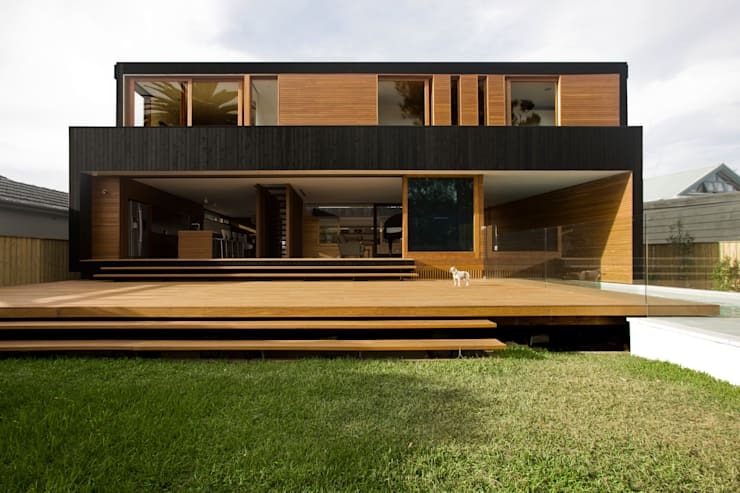 Vertically placed wooden panels emphasise the house’s length while also contrasting most effectively with the narrow vertical windows. 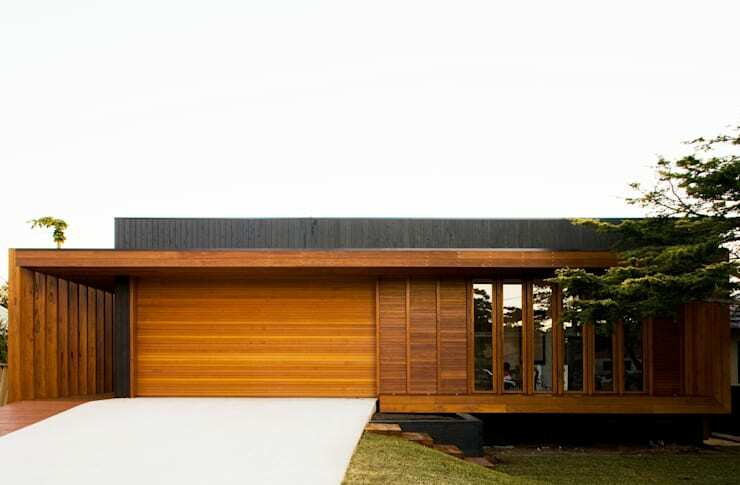 Sliding elements were placed in front of these windows to function as sun protection, allowing the facade to be closed up entirely and resulting in a solid wooden box. The main entrance is located on the left, almost completely hidden away due to the wide variety of other factors that demand our attention. 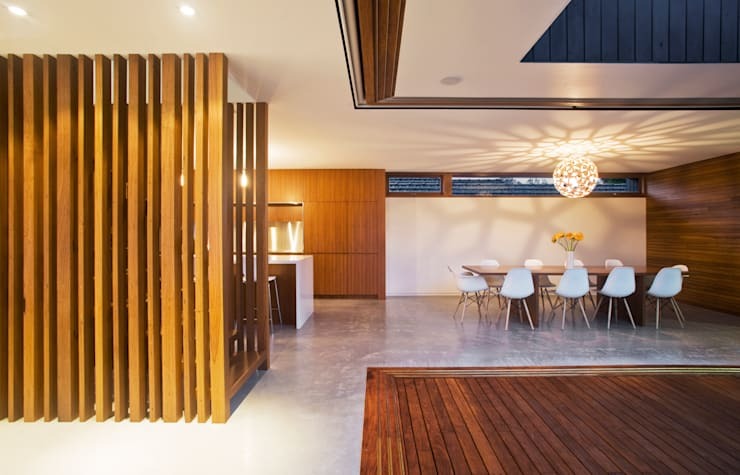 A timber-floored courtyard can be found inside the house, providing a windless and private area for the owners; a closed room under the open sky. This area beautifully promotes the spaciousness of the villa while also allowing a fresh dose of sun, light, and air to circulate within. Seeking some Simple ways to improve your small courtyard? Take a look, then! The house’s ground floor is laid out in an open-plan, yet cleverly divided up into different areas: living room, dining space, kitchen, study, and swimming pool. The arrangement of furniture and décor pieces was done deliberately to enhance the ever-present view of the freshwater lake in the background. And when spring or summer comes knocking and those temperatures start to rise, a few simple slides allow those majestic doors to open wide and welcome in some cool breezes from the adjoining water body. When the building materials were chosen, timber and stone were the two main stars of the show. Simple designs and elements were opted for, all of which are adorned mainly in brown and white tones, creating an elegant and sophisticated space. The structuring of the rooms was based on the central location of the courtyard, a strong feature of the villa’s design. All of the individual rooms were laid out in a circle surrounding it, flowing freely into one another, yet visually separated through means of furniture placement and spaces. The open-riser staircase fits in marvellously with the villa, especially its striking exterior surface. 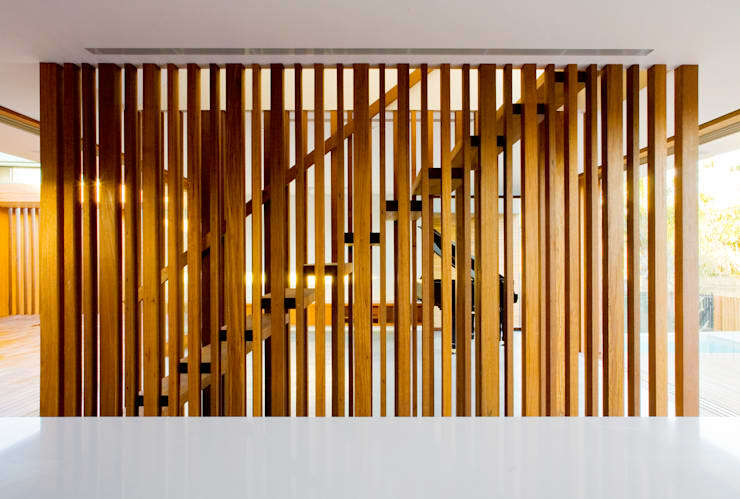 Vertical beams were placed on both sides of the steps, holding the stairs firmly in place and acting as beautiful hand railings for the user. But it’s far from a claustrophobic situation, as the beams are comfortably spaced apart to ensure a decent view of the surroundings, as well as that a dose of fresh air and natural light join the steps on their way up/down. 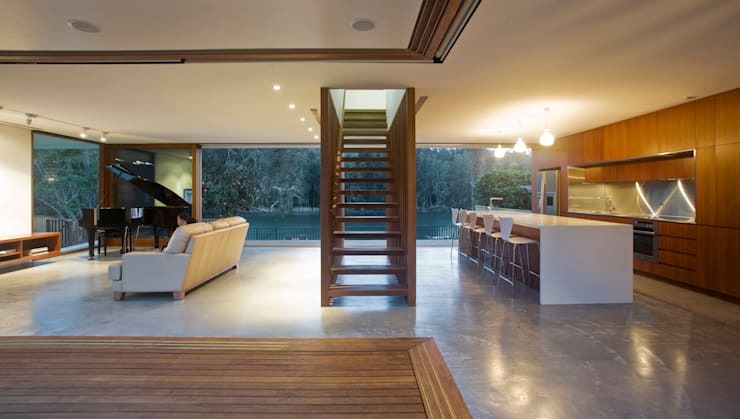 In addition to a permanent view of the lake, this architectural beauty also boasts a stunning swimming pool, a crucial feature for cooling off from that hot Australian sun. Embedded in the wooden deck, the pool flaunts a delicious dose of cool blue against the honey-coloured timbers. And elegant glass balustrades ensure safety first by separating the pool from the courtyard. From architects and bathroom planners to plumbers and lighting experts, we have an entire range of expert professionals here on homify. Take a look!